This reference chart is not exact or concrete. 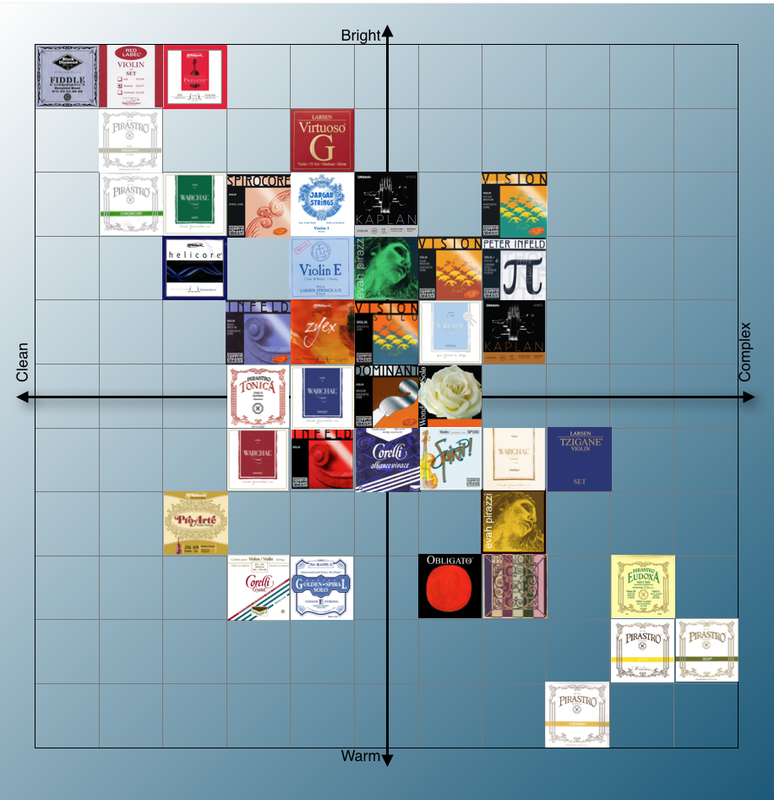 Data is a mix between submitted reviews and input from ViolinStringReview staff. Chorda - Pirastro - Pure Gut strings. These are intended to be used with Baroque instruments. They have some of the lowest tension, and warmest sound of any string on the market. Eudoxa - Pirastro - Very warm sound. They are slower to respond than other gut strings. They sound very similar to traditional gut core strings, and have a huge range of colors. Gold - Pirastro - Warm sounding wrapped gut string. They come in only one gauge, and is in the middle of the road compared to other gut strings. The E if very popular for violinist mixed with other synthetic strings. Oliv - Pirastro - Brighter in tone than Eudoxa strings. Tend to have a slower break in time than other gut strings. Very rich, and complex tone, but have trouble staying in tune. Passione - Pirastro - a very stable gut string. They are more brilliant than other gut strings, and less complex. Amber - Warchal - Low tension strings. very similar to Obligatos in tone. very smooth feel. Ametyst - Warchal - Low tension strings. They come close in feel to gut strings. Brilliant - Warchal - Like Dominants, they tend to have a metallic sound at first. After a few days they become more pitch stable, and project very well. Cantiga - Corelli - Think of Cantiga strings as neutral+. The tone, complexity, and projection are all just a hair higher giving a brilliant feeling without loosing any warmth. Crystal - Corelli - Very dark, and warm sound. They can feel a bit dull. These are good on very bright instruments, and are comparable to Pro Arté strings. Dominant - Thomastik Infeld - Made with a perlon core. Dominant strings may have a metallic sound at first, but settle in after a couple days. These strings are very flexible, and have a warm tone for synthetic strings. Dominants are many times considered the industry standard, and used by many of the worlds top professionals. Evah Pirazzi - Pirastro - A very popular string, and very popular with professionals. Evah Pirazzi strings have a slightly brighter tone with a quick response. Evah Pirazzi Gold - Pirastro - These strings are new to the market. They are lower in tension, and warm. Although they are on the expensive side they receive very favorable reviews. Infeld (Red and Blue) - Thomastik Infeld - These were released as a better Dominant. The Blue has a bright tone, while the red is darker. These are good choice if you like the Dominant, but would like a slightly different tone. They seem to be lacking the complexity of Dominant strings. Kaplan (Vivo and Amo) - New string to the market from D'Addario. They are made with a zyex core and have identical tensions. Vivo is very loud and will work as a great solo string set or brighten up a dark instrument. Amo is also quite loud but has a warmer tone better suited for already bright instruments. Karneol - Warchal - A bit higher tension than Ametyst. They are a bit softer/warmer in tone compared to most synthetic strings. Larsen - These synthetic (Viola and Cello are metal) strings are a great neutral string. They are a good alternative to Dominants. Obligato - Pirastro - Warmer sound than dominants, but still holds a powerful punch. These strings are rich with overtones, and very closely resemble gut strings like Eudoxa. PI (Peter Infeld) - Thomastik Infeld - New to the market, these very pricy strings have a very sweet tone when first installed. The sound seems to mellow out after a couple weeks, and looses its punch soon after. Pro Arte - D’Addario - Perlon core string that is quite warm sounding. These can sound a bit dull already dark sounding instruments, but can sound great on brighter student model instruments. Spirit - Thomastik-Infeld - These synthetic strings are marketed as a set for "amateur" players, but have quite a lot of richness and work well as a slightly darker Dominant string with fast response. Tonica - Pirastro - Dark sounding perlon core string. Comparable to Pro Arte strings they are not very loud, and are a light tension. These are great on student instruments looking to have a warmer tone. Tzigane - Larsen- Very low tension for a non-gut string. They feel very soft, and have a sweet sound. They have a very large resonance making them quite loud even with their lower tension. Virtuoso - Larsen - Quite clean and loud. Great for a soloist looking to have a sound above an orchestra without a high tension. Vision - Thomastik Infeld - There are multiple versions of vision strings (Vision, Solo, Titanium Orchestra, Titanium Solo). The strings are very durable, and have great projection. They have a brighter sound than dominants, and are comparable to Evah Pirazzi. The most notable thing about these strings are the titanium E which has a very clean sound. Wondertone - Pirastro - These strings settle in very quickly. I would consider these to be Pirastro’s competitor to on the Dominants. Like Dominant strings they may sound metallic-y at first, but break in fast. Zyex - D’Addario - Zyex cores are not like Perlon. They settle in extremely fast, and are very well rounded. The strings are not as warm as Dominants, but not overly bright. Many review say that these strings are just loud. D’Addario has changed their string formula, and are not as harsh as earlier reviews describe. Black Diamond - These have been around for many years. They are most likely the cheapest strings you will find. Great for fiddling. Chromcor - Pirastro - Steel string with a bright sound, fast response, and Large volume. Helicore - D’Addario - multi-strand steel core string. These strings are thin in diameter, but still hold quite a punch. They are some of the warmer metal strings out there, and good for student instruments that want a most complex sound. They are still used but some of the top fiddlers today. Jarger - These are warmer steel strings that are used a lot for viola, and cello A strings. Although it is a metal it does balance well with other synthetic, and gut strings. Kaplan - D’Addario - The gut strings called Golden Spiral changed their name to Kaplan, and then went out of production. There is a new metal Kaplan string in the works at the moment for violin which is already available for viola, cello, and double bass. There are a few different E strings already available. One of which is a wound E, and a great option for someone having trouble with the E string whistling. Their full sets have a surprisingly warm sound, and project well. These are comparable to some of the more expensive higher-end strings on the market. Nefrit - Warchal - Combined metal and synthetic core set - metal core E and A strings, synthetic core D and G strings. This is Warchal's only set net intended for professionals. Good for electric instruments. Piranto - Pirastro - Disturbed as “attractively” priced, these strings are bright, and good for inexpensive student instruments. Prelude - D’Addario - Sold core steel string. These are good for inexpensive student instrument, and have a bright tone. Red Label - SuperSensitive - These have been the industry standard of fiddlers, and school student instruments for years. They are very bright, inexpensive, and durable. They do not carry many overtones, and are a bit flat for classical musicians. Spirocore - Thomastik Infeld - Multi strand steel core string. These are more elastic than Red Label, or Prelude, and have a warmer tone. They are comparable to Helicore strings.